Just, wow. I love everything about this book. Shakespeare presented in a fun and interactive way that kids can understand – what could be better? Welcome to the world of Shakespeare - to Stratford and London, to poetry and plays, to words and clever phrases. 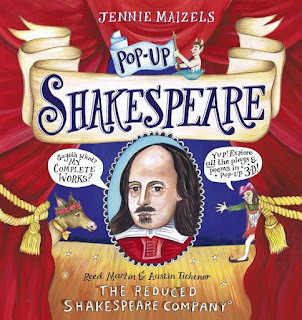 This stunning pop-up book presents Shakespeare’s works in a way that will incite kids' interest and imagination and leave them wanting to find out more. The layout is fantastic with information broken up into nice digestible chunks across the pages, balanced with delightful illustrations, interactive flaps to lift and discover, as well as the fabulous pop-up illustrations. The book begins with general information about the world of Shakespeare, then moves on to a two-page spread on each of the categories of plays: the Comedies, the Histories, the Romances and the Tragedies. Not only does this book tell you about all of Shakespeare’s plays but it helps kids to engage with them and appreciate their fun and interesting stories and poetic rhythm. There is so much information contained in this book that will keep kids coming back again and again. The poetic rhythm of sonnets are described in a way kids can understand “da-DUH da-DAH da-DUH da-DUH like a heartbeat!” in a little lift flap book within the book, which gives famous quotes from sonnets then interprets them in a fun way, eg “When I’m bummed out, you make me happy!”. I read this book with my eight and ten-year-olds, who both loved it. It prompted lots of questions and answers and discussion and introduced them to a world of classic literature that they were not familiar with. They loved the pop up spread on a Midsummer Night’s Dream, laughed at the donkey headed Bottom and enjoyed exploring the little flap books and random facts. 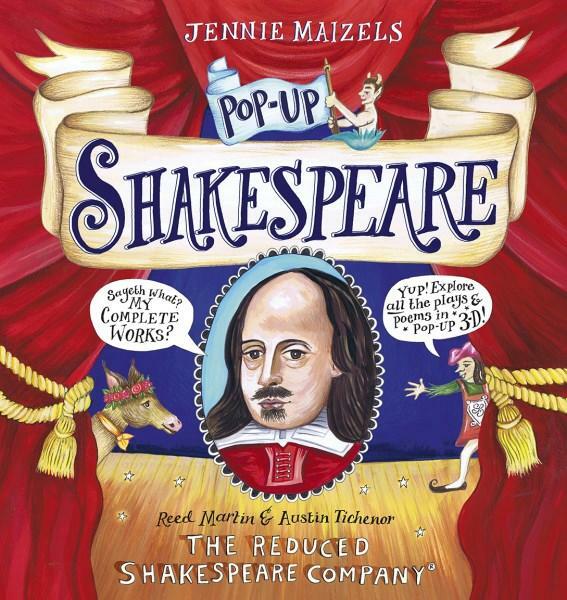 The beautiful and imaginative pop-up illustrations are true to Shakespeare yet funny and quirky at the same time. The pop-ups are in the shapes of castles, ships and forests to tie in with the plays they are describing and there are so may interactive flaps, speech bubbles and discussion points scattered throughout that the kids can spend hours poring over the detail. I really can’t speak highly enough of this amazing book. It is so well thought out, so well designed and an absolutely perfect way to introduce Shakespeare to younger audiences. Well done to Jennie Maizels and the Reduced Shakespeare Company. I’m so very glad to own this book!